Masters Tournament organisers are set to introduce a network of snow cannon to Augusta National in a bid to toughen the course against distance gains with modern golf clubs, a press conference heard today. Work is currently in progress on a $700 million project which will see every fairway and green lined on either side with state of the art snow cannon capable of covering the entire course in a thick blanket of snow and ice in under 15 minutes. 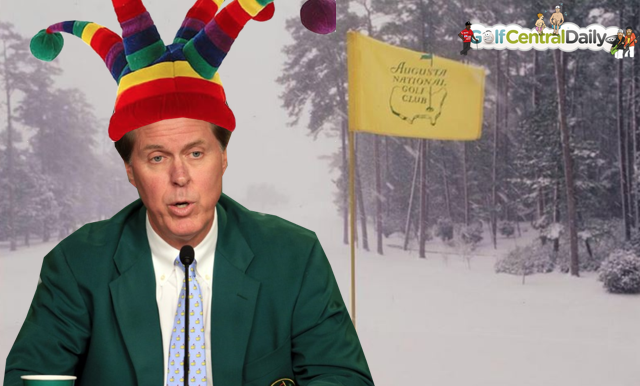 "After seeing Dustin Johnson drive the par-5 15th last year we figured we better face facts" said Masters Chairman Fred Ridley. "We tried asking the equipment and ball companies to roll back the distance technology but they all told us to piss off. Then one of the guys said 'lets see DJ do that at like minus a zillion degrees in a blizzard with driving snow burning into his face' and we all said 'hey that's a great idea, let's do it, I mean we have the money for it!'". Several pros including Tiger Woods and Rory McIlroy have already been spotted practicing in full ski gear while it is believed TaylorMade are working frantically on 28 different types of heated goggles. "True, it has been getting ridiculous recently so we would really like the winning score to be somewhere in the region of 50 over next year," added Ridley. It's going to be great watching some of the best folks in the world battle it out with frostbite."